These programs are completely FREE for you to enjoy. You may also distribute them freely to your friends and peers, provided you send them the complete installation file. Please note that NO SUPPORT is given for the programs, except for this web, which contains basic information, some Frequently Asked Questions and a feedback form for error reports and testimonials. Click the pictures or the links for more info and download. 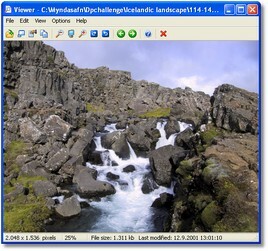 Viewer is a handy program to view images and text files. Other unsupported files will be shown in hex-mode. No modifications are allowed, so you will not accidentally modify your files, only view them. You can zoom, rotate, copy to clipboard, and move fast from one file to another in a folder. This program is provided as a free viewer for our flagship product, AcuteFinder  which is by many considered to be one of the best duplicate file finders in the world. Viewer can also be used as a standalone program, and you can easily associate it with various common filetypes via Windows Explorer. So, just give it a try! More to come ... soon!